Mick Wallace told the Dáil the ultimate cost of the hospital could be in excess of €2.2 billion. 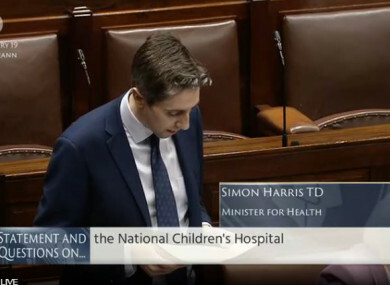 MINISTER FOR HEALTH Simon Harris has said that the State is “building the right hospital for the right reasons”, and that the PwC review under way into the cost overrun at the National Children’s Hospital would shed light on the circumstances which created the estimated overspend. Harris was speaking during an often tense debate in the Dáil this evening, where he faced questions about the growing scandal concerning the escalating costs of the hospital. Wexford TD Mick Wallace, however, urged the government to “stop this contract now” and said “you would save a lot of money” by doing so, predicting it may ultimately cost more than €2.2 billion. Pressure has been mounting on government, and in particular the health minister, in the last week over the skyrocketing costs of the project. In recent days there has been a focus on the health minister and his failure to tell the Taoiseach and Minister Donohoe of the estimated cost when he was informed in August. A Mazars report commissioned by the National Paediatric Hospital Development Board, meanwhile, has highlighted that in the space of just over 18 months, it became apparent that the costs of the hospital had risen by 56%. Harris was put under pressure in the Dáil over the cost overrun, initially by Fianna Fáil’s Stephen Donnelly. He said that previous reasons for the overrun cited inflation as a key cause, but that didn’t tally with the report. It also says that construction activities and monitoring of the guaranteed maximum price will need “constant and active management going forward”. The Mazars report also tracks elements of the cost overrun over the course of 2017 and 2018, and says that urgent budgetary control systems should operate in terms of design, process and reporting. Harris told the Dáil that neither he nor the government would fall short in holding those responsible for the cost overrun to account, and said the PwC report which is due to be completed next month would go some way towards ascertaining responsibility. “It is true – absolutely true – that costs have increased significantly,” he said. “Taxpayers – and the government – want to know their investment is being managed correctly. It is important we give the review an importunity to do its work. Deciding the outcome of reviews before they report is becoming all too common in Irish politics. I firmly believe we’re building the right hospital for the right reasons. Donnelly also asked the minister if he’d aggressively pursue cost reductions, and Harris said he would on an evidential basis. There were angry exchanges on a number of occasions, as Harris fielded questions from Sinn Féin’s Louise O’Reilly and Solidarity-PBP’s Mick Barry. O’Reilly said Harris hadn’t apologised for the overspend at the hospital and said the buck stopped with him in the matter. She also accused the minister of giving the board of the hospital a “massive seal of approval” by reappointing them last summer, when he was already aware of a degree of overrun in the spending. “This arose on their watch, and yours,” she said. Independents4Change TD Mick Wallace told the Dáil that he believed the process of construction should be stopped, as costs had the potential to escalate further, and was sharply critical of construction firm BAM. Wallace said it wasn’t the case that Harris “knows” it will definitely be built. “I would predict that this project won’t be built if we continue with this procurement and this contact process,” he said. I honestly think you should stop this contract now. You would save a lot of money. Email “'Stop this contract now': Harris pledges accountability in Dáil debate on hospital cost overrun”. Feedback on “'Stop this contract now': Harris pledges accountability in Dáil debate on hospital cost overrun”.